This Natural water fed by a spring reputedly contains Carp to over 30lb. Top lake appears to hold tiddlers and good Carp but it a mass of weed. 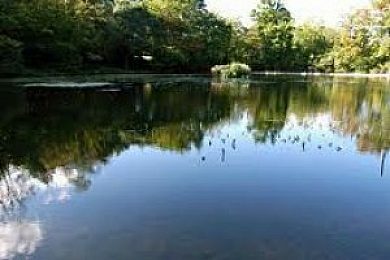 Middle lake is the largest but is ringed by wide lily beds with gaps in only two swims on opposite sides of the lake beside the road. Tench reside in the leftmost swim (viewed from the road). Good disabled access to a couple of swims to left of lake by the road. If you are a dedicated Carp or Tench angler then it should be rewarding. Easy parking on road by middle pond or in car park of the A233.